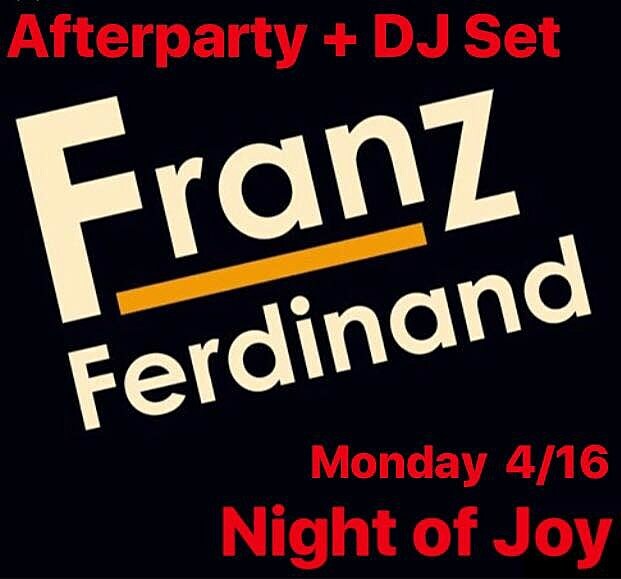 Franz Ferdinand are currently in NYC, having played their first of two Brooklyn Steel shows on Sunday night (4/15), as part of their Always Ascending tour. In addition to cuts from the new album, their first since the departure of guitarist Nick McCarthy, they played most of their classics as well, including “This Fire,” “Jacqueline,” “Come On Home,” “The Dark of the Matinee” and more. Setlist is below. Brooklyn’s Bodega, who are a good match for Franz Ferdinand and whose debut album is out in June, opened and will do so again tonight (4/16). (If you’re going, definitely catch their set.) Tickets are still available. There is also an afterparty for tonight’s show at Williamsburg’s Night of Joy where the band will be DJing. Flyer for that is below and pictures from Sunday’s Brooklyn Steel show are in the gallery above.